a collection of common functions shared by all NFD managers and RIB manager, such as communicating with the dispatcher and command validator. Definition at line 48 of file manager-base.hpp. Definition at line 78 of file manager-base.hpp. Definition at line 33 of file manager-base.cpp. Definition at line 68 of file manager-base.hpp. Definition at line 156 of file manager-base.hpp. Definition at line 42 of file manager-base.cpp. Referenced by nfd::CsManager::CsManager(), nfd::FaceManager::FaceManager(), nfd::FibManager::FibManager(), nfd::rib::RibManager::RibManager(), and nfd::StrategyChoiceManager::StrategyChoiceManager(). Definition at line 51 of file manager-base.cpp. This is called after the signature is validated. Definition at line 57 of file manager-base.cpp. 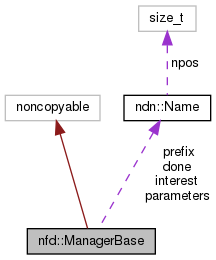 References ndn::Name::at(), ndn::Block::blockFromValue(), ndn::Interest::getName(), ndn::KeyLocator::KeyLocator_Name, and ndn::signed_interest::POS_SIG_INFO.